Excerpt: There is recent resurgence in the study of crystals through the use of the spindle stage — a rather simple accessory consisting of a flat sturdy base (homemade from metal, hard plastic, or poster board), a protractor to indicate the angular degrees of the spindle’s rotation, the spindle or needle onto which is glued the single crystal to be studied, and a glass microscope slide dock with a well to hold the refractive index liquid — positioned on the polarized light microscope. The spindle stage emerged from the optical crystallography and mineralogy work done by F.T. Jones, N.H. Hartshorne, and R.E. Wilcox. Professor F.D. Bloss, in the early 1980s, refined a mathematical algorithm that related the extinction positions of a single crystal on the PLM to the optic axes of the biaxial indicatrix. This resulted in EXCALIBR, a computer program that takes values measured on the spindle stage and calculates the optic axial angle (2V). Abstract: The polarized light microscope remains the single most useful tool in identifying minerals. Using a spindle stage, a user can orient a crystal’s principle refractive index (RI) vectors, parallel to the lower polarizer, and in turn, observe its RI. Finding the principle RI vectors is accomplished by using either conoscopic methods, or more simply, using extinction data as inputs in the program EXCALIBR, which was developed by Bloss and Riess in 1973 (1). The use of EXCALIBR has major advantages over conoscopic methods, but it is hindered by interface and compatibility issues. Presented here is a Microsoft Excel spreadsheet named ‘EXCELIBR,’ which performs similar functions to EXCALIBR, including solving for the optical orientation of biaxial or uniaxial minerals using extinction data. Using Excel as the interface, EXCELIBR is accessible, familiar, and versatile for the user. The program is useful for preliminary screening of a crystal for X-ray studies, optical characterization of minerals, and rapid mineral identification. Included with its crystal-orienting calculations are tabs for double variation and RI modeling, similar to those in Opt_cal, a program that calculates miscellaneous optical properties of minerals (2, 3). 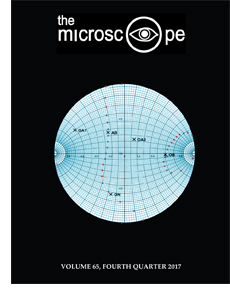 The Microscope 65 (4), pp 153 – 158. Originally published in The Microscope, Vol. 40, First Quarter, pp 81-92, 1992. Abstract: The crystal symmetry of minerals, isotropic vs. anisotropic (and biaxial vs. uniaxial) can be determined by observations with a polarized light microscope. However, in certain instances, minerals can exhibit apparent optical symmetry higher than the crystal system they belong to. For example, the two refractive indices of a uniaxial mineral become equal, making the mineral appear isotropic and thus belong to the cubic crystal system. Usually, any change in optical class is accompanied by a change in optical orientation. These unusual optical coincidences are often observed when mineral groups are studied very carefully, using both optical and X-ray methods to track changes in optical orientations and refractive index for single crystals in solid solution series. However, chemistry is not the only variable that causes a mineral to change its optical class and optical orientation; these changes can also be caused by dispersion, temperature, and structural state. Excerpt: What is our principle ally in medicine? Body scanners? Antibiotics? That friendly physician whose charm and charisma settles the soul? A big budget from your medical insurance? None of these. It is something that doesn’t cost a cent, can make decisions that elude the cleverest doctor, carries out meticulous tasks no robot could replicate, and with which you come already equipped — the living cell. Now we are harnessing the magical capacity of stem cells, the most miraculous of all cell types. So far, we have done little to capture their potential, but it is the study of stem cells that is set to revolutionize medicine. We take a lot of credit for our medical expertise. Most of it we don’t deserve. We say how well we can heal a sore, close a wound, mend a bone, treat a trauma; but usually the human doctor plays a minor role. Our main task is not to bring about the miracle through intellectual ingenuity, but to harness the ability of stem cells to do the work for us. Ammonium nitrate has five polymorphs (that we know of), each with its own temperature stability range. 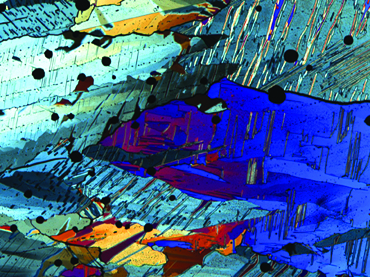 The polymorphic form in this photomicrograph is Form II, the ‘room temperature’ stable form in the range from -16Â° to 32Â° C. Form II ammonium nitrate is orthorhombic and very highly birefringent (0.224) as exhibited here in this fusion preparation photographed with the polarized light microscope at ca. 25Â° C, crossed polars, 100x.